living in New York City; since 2002. MyBandStock is an Ann Arbor startup that enables you to buy 'stock' in bands. The bands set up a funding goal for a project like recording an album, and once they reach the goal the site directly pays the supplier of services, such as the recording studio. This way, investors know the money will be spent on the goal that was presented, rather than booze or swimming pools filled with Jello. Interestingly, there is no idea of the investors actually owning a part of the band's earnings and therefore achieving a monetary return on their investment. Instead they are meant to be offered 'perks' like downloads, CDs, signed t-shirts, personal phone calls, and so on. In this way it's almost like a paid fan club, but the added dimension of the band getting an advance from fans rather than a record label is compelling. Since Radiohead started using it I've known the Ondes Martenot was a very cool instrument, that it's rare, and that it was used by the composer Olivier Messaien. But I never realized how it worked, and just how ridiculously cool it is, until I watched this video demonstration by one of its foremost experts. The Martenot has a keyboard that produces an ethereal sound that wouldn't be out of place on a modern synthesizer, and the timbre can be modified with some controls similar to the stops on an organ. The keyboard adds an extra dimension of expressiveness with vibrato that works by simply nudging the entire keyboard back and forth with the finger you're using to play the note! Then there's the feature Jonny Greenwood loves, a string that runs the length of the keyboard just in front of the keys, with a metal loop that goes around the player's finger to pull the string back and forth. This produces a smooth tone with continuous variation in pitch. I'm kind of amazed that this feature hasn't been incorporated into more modern instruments. Portamento is probably seen as the substitute, but there the glide between pitches, while customizable, is basically the same on every note transition. This leads me into an observation I've been mulling over about instrument design. Modern instruments, from synthesizers to drum machines to laptops to circuit-bent toys, offer us plenty of novel sounds and compositional techniques. But for that they seem to trade in the expressive power of classic instruments. When I play the guitar, piano or drums, it's very natural for me to match my playing to the mood of each moment in the song and introduce variations that add interest. The actions of my fingers are intimately connected to the variations in sound. With a synthesizer or a drum machine the best I can hope for is that the timbre as well as the volume will be affected by the velocity with which I play a note. Further control is only offered by knobs, sliders or the pitch wheel, a less direct connection to the actual playing of the instrument. On a laptop I program a beat that by default will be exactly the same throughout a song, and I add variations using a mouse, a far more laborious process than simply playing it the way I want it to sound. Much recent software development, such as some plugin effects by Audio Damage, is intended to counter the monotony of programmed beats in loop-based music with randomized variations. You can request a reverse playback, or a stutter, or a repeat of the snare hit 33% of the time, and you can achieve some very neat sounds this way. But randomization is never going to sound the same as a talented human musician's reaction to a song and to other musicians. What tends to happen with circuit-bent toys and other experimental instruments is that I figure out quickly the one or two sounds they can produce and I find a song to use it on. It's not worth my time trying to master it the way I would study the guitar, because there's no mastery to be had. And ultimately single-use devices are not going to be worth the space they take up. I think this is also why I've had so much trouble getting anywhere with ChucK, a music programming language. Periodically I get very excited about it, start playing around, and end up with yet another random melody generator. The language is extremely well designed and powerful, but programming is just a very remote, cerebral interface to music. Or to put it another way, generative music, while conceptually appealing to me, is hard to do well. Lastly, this ties in to why people often find electronic music performances boring. I think at a primitive level we like to be able to visually connect the musician's movements the sounds being produced. We can only guess at what is being accomplished with knob-twiddling and a mouse. To sum up, while I always applaud inventors of these instruments, software and other devices, I think we would do well to remember what has allowed the classics to endure for so long. I am of course happy to hear about counterexamples that have offered great expressive power. And come on, let's build a new Martenot already! If you're just joining us, I'm going through the entire process of making macarons and considering the different approaches and what's worked best for me. To review, the shell's main ingredients are almond, egg white, confectioner's sugar, and granulated sugar. The almond portion of the shell must come from almond flour or meal. (I've found the Bob's Red Mill brand at Whole Foods and other stores in New York, or you can order it here.) It's important for the texture of the final product that the flour be as fine as possible, so you should put it with half the powdered sugar in a food processor to fracture the larger grains; the sugar keeps it dry and prevents it from becoming almond butter. If you don't plan to use almond flour for a while, refrigerate or freeze it. The next step is to filter out the large grains that remain by putting the almond flour through a tamis, a flat fine mesh sieve. I've been getting by with a mesh strainer and a spoon, but this is one of the most arduous and time consuming steps in the recipe, so any tool that makes it easier may be a worthwhile investment. Lastly, mix the almond flour with the rest of the confec. sugar and you've got tant pour tant! The egg whites are a fun little world all their own. There is general agreement that older egg whites have a thicker consistency that is better suited to making foams. Some simply recommend using egg whites you bought a week or two before, while others talk about leaving the whites out, uncovered, for anywhere from an hour to three days to let some of their water evaporate. (Supposedly they have their own bacteria-fighting agents; your disgust may vary.) I haven't found all this to be strictly necessary, but I do use older whites when I have them, and let them sit for a little while when I don't. There's also been talk of using powdered egg whites to help stabilize the foam. I finally found some, the "Just Whites" brand, at an Upper West Side health food store, the kind that sells a lot of other foods and nutrients in appetizing powder form. I've been sprinkling in a pinch of them, but again, I wouldn't go out of your way for it unless you're stuck for ideas, or obsessed like me. Cream of Tartar can also perform this function. The sugars, thank goodness, are just sugar. So you've got your tant pour tant and your aged egg whites. If you're going with meringue Italian style, proceed by putting your granulated sugar in a saucepan with just enough water to wet it thoroughly. You will heat the sugar up to about 114 Celsius, and while it is heating use your mixer to whip the whites to stiff peaks. 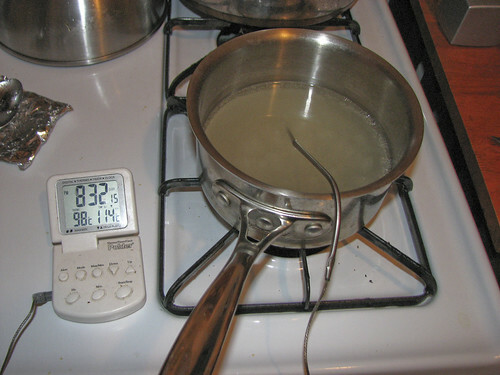 The former task requires a candy thermometer and careful observation so that the sugar doesn't burn or become caramel. Once it's hot enough, slowly drizzle it onto the egg whites while you continue whipping. Make sure it doesn't all sink to the bottom, and the meringue should become extra glossy. Don't worry too much about overbeating, as you want the mixture to become stiff enough that you can turn the bowl over and see essentially no movement. It's as I'm finishing this step that I like to add coloring. Note: this was where the PH10 and Syrup and Tang recipes went horribly wrong for me. With half the egg whites left out of the meringue, there was not enough to absorb the sugar, and I ended up with something bearing a striking resemblance to marshmallow fluff. In fact that's what it may have been! If you've got a nice meringue, the time has come to mix it with the TPT and finish the batter. I found this to be a nerve racking moment, as it determines whether the texture will be right, yet any damage has probably been done--there is a limited amount of magic one can wield with the right folding technique. Everyone says the batter should "flow like magma," but for some reason it took me a long time to figure out that this meant very, very slowly. It should look like it's stationary at a glance, but settle a little bit over the course of 30 seconds or so. It's also commonly said that you should not worry about the meringue falling, because it is supposed to fall. I think the reality is a fascinating mixture of a gooey batter and the foamy meringue, and that's what makes these cookies unique. In any case, you want to mix the ingredients thoroughly but not more than necessary. - Target templates made in your favorite application with 1.5" diameter circles spaced 1.25" apart, on 8.5x14 paper. You'll put these underneath your liner (I use Silpat, others parchment paper). - Ziploc sandwich bags. If you're proficient with a pastry bag, more power to you, but the batter is quite sticky and I really appreciate knowing it's not going to leak out the other end (that sounded dirty). Prepare your baking sheets with the templates and distribute the batter into the bags. I prefer to stretch each bag over a glass when doing this. When you are ready, cut a 1/4" to 1/2" diagonal off the corner of one of the bags. To pipe, position the bag vertically about an inch over one of the targets. It will take considerable practice to get the right size and shape. The best you can hope for until you become a zen master is that all the irregularly shaped ones have decent matches. 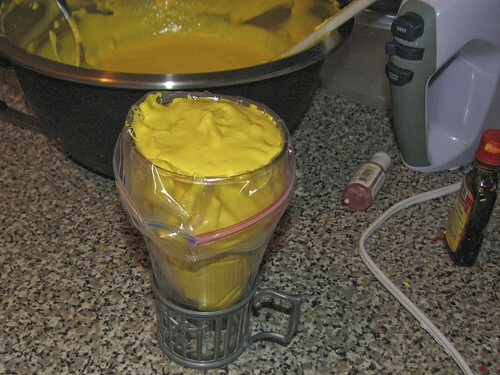 If your batter is stiff enough the batter may not spread to make a smooth top. In this case, dip a finger in water and carefully pat down the peak. If you are decorating the shells, this is the time to do it. For my mogador recreation I used cocoa powder and a makeshift sprinkling device. Once piped, the cookies must sit out for anywhere from 30 to 60 minutes before baking, depending on the consistency of the batter. When ready the tops of the shells should appear dry and you should be able to touch them (carefully!) without any batter sticking to your finger. A fan can speed the drying process. There are a LOT of variations here and I tended to constantly adjust my strategy batch by batch, but I'll try to cover as many ideas as I can. Oven type: some prefer convection, others don't. You're probably just going to use whatever you have anyway. Shelf placement: originally I used The Sweet Life's idea of putting one oven shelf on top and one near the bottom, and rotating baking sheets between them after half their baking time. Lately I just put one shelf in the middle so I can give each batch my full attention. Temperature: 325 to 375 F. Some say to use 375 for the first half of baking, then lower it to 325. Others keep it constant. Some allow the temperature to fall by propping the oven door slightly ajar during baking, also mimicking convection with the airflow. Time: anywhere from 15 to 20 minutes depending on the consistency of the shells. What to look for: The cookies should rise and get their 'feet' after the first six minutes or so. After that you're waiting for them to bake enough to easily come off the baking sheet without getting too browned on the top. If this proves difficult it's probably because your batter was too fluid or your meringue not stiff enough. Removal from the baking sheet: People have suggested all kinds of methods for this, from lifting up the lining and running water onto the hot baking sheet to steam them off, to placing them in the freezer for a minute, to voodoo-esque rituals. I've pretty much found, at least with Silpat, that they're either ready to come off and it's easy, or they're not and it's impossible and you disembowel them, as seen below. You can sometimes salvage things by putting them back in the oven for a minute or two. Where did I go wrong? If your shells cracked in the oven, it may mean they didn't dry long enough. If the tops wrinkled or are very thin and fragile, it's probably a consistency or mixing issue. If the feet are absent or deflated, it's yes, consistency. If the shell rose unevenly or had an aneurysm and exploded out of the top, it's because during piping the batter got 'stuck' to the sheet at one or more points around the edge. You can learn to spot this and free it with a knife before baking. 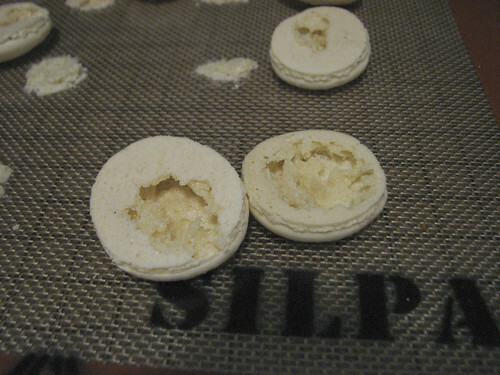 The air pocket that develops in the middle of the shells is something I don't see in Pierre Hermé's cookies. But I haven't been able to get rid of it, and it isn't a huge problem as long as the tops are strong enough. If you've made it this far, congratulations, you're insane! Next time I'll talk about fillings of both the cookie and dental variety, seeing as how one leads to the other and all. FX Cuisine documents the well-funded culinary adventures of a French-speaking Swiss man. While I envy his photographic setup and his travel budget, I have to give him credit for being much more of a journalist than most travel or food bloggers. Check out in particular his photo essay on Japanese bladesmiths, but they're all pretty good. I'm fascinated by the story of what happened to Hannah Upp, who apparently suffered from dissociative fugue. I find the mix of symptoms of this awesomely-named disorder to be amazing: 1. Forgetting your identity 2. Wandering and making no attempt to figure out who you are, even actively avoiding being reminded 3. Somehow mostly managing to survive, i.e. eating, while brazen enough to jump into the Hudson river 4. 'Waking up' with your whole identity coming back to you, but with no memory of your time in the fugue state. If it had a different final explanation this would make a great Sherlock Holmes story. It also reminds me of difficult software bugs where the cause is simple (i.e. some rewiring in the brain) but the outward effects are complex. The Handbook of Indigenous Fermented Foods. So awesome that this exists, and a good thing it's on Google Books, as a hard copy costs $280. Via gothamist's preview of the new Fatty Crab restaurant. How politics works. We can't let drug users out of prison! Then the prison guards upstate would lose their jobs! Foreign Policy Passport looks at the possible end of tax havens and recalls an argument in favor or preserving them. I've been turning this issue over in my mind ever since and finally posted a comment on the story. Daniel Mitchell claims that tax havens are a good thing because they force governments in places like the U.S. and Germany to lower their tax rates, as if they don't capital will simply flee to a better place, like Monaco, Andorra, or the Cayman Islands. In other words, it creates competition. He cites the figure of $12 trillion of foreign investment in the United States as a result of this. When I initially read this, it made me a little angry, but I was having trouble articulating just why. I made a goal of thinking through my opinion, and I'm open to alternative viewpoints. It's obvious that this competition in tax rates is not really a fair one. The places that have become tax havens can afford to do so because they are small and their populations are rich, so there's little demand for government services. Can you blame Germany for wanting to base its tax policy on its own needs, rather than those of tiny European duchies? On the other hand, what does it really mean when a business takes advantage of a tax haven? Are they really 'investing' in that country, or are they just paying it a nice fee to file their paperwork and keep their mouths shut? I don't really know the full answer to this question--it probably depends on how one is using the tax haven. But a hedge fund incorporated in the Caymans still takes full advantage of the infrastructure of the cities and states where it actually does most of its business, so again, I understand the anger toward the havens. For me what all this comes down to is that Mitchell's real argument is that any way you can force tax rates down, no matter how illegitimate, is fine, because he'd rather have no taxes at all. Plenty of people do feel that way, but Mitchell doesn't really admit that this is his reasoning. This past fall I made about five full attempts at macarons, trying to achieve the perfect appearance and deliciousness of Pierre Hermé's creations. I'm happy to report that by the last couple of tries I was pleased with the results, and so it seems like a good time to document what I've learned. Let's take a step back at this point and talk about what a macaron is and the desirable qualities therein. 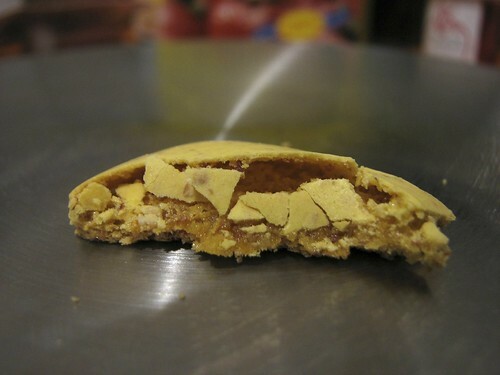 It is a sandwich cookie with two light "shells" that are made of a nut powder (usually almond, hazelnut is also an option) and a meringue (egg whites and sugar). The filling is most commonly either a ganache or a buttercream, with flavors limited only to the baker's imagination. Bits of fruit, jelly or nuts can also make their way into the middle of the macaron. In appearance, the shells should be smooth and rounded, with frilly 'feet' around their bottom, and are often colored to match the filling's flavor. The filling should be a rounded disc about as thick as each shell. The texture of the shell is crumbly, airy, and only slightly chewy, and its flavor is mild, with the filling taking center stage ("melts in the mouth" is a common report). 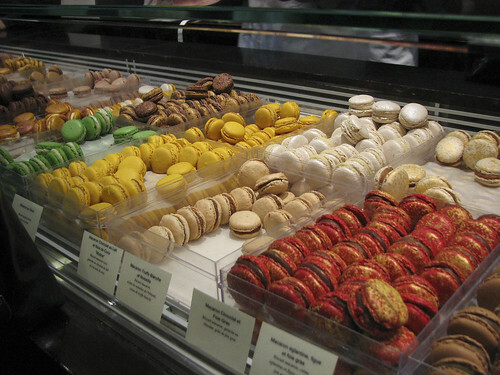 Some complain that a lot of the macarons they've had are too sweet. This gripe has honestly never occurred to me. Why do macarons inspire obsession? I think it's a combination of the difficulty in their preparation, the dazzling appearance of a multicolored selection, and the multitude of flavors that can be incorporated. Nicole Kaplan's "macaroons a la pierre herme", as posted on eGullet. Kaplan is a renowned pastry chef who has worked in Hermé's kitchen, as well as Eleven Madison Park and Del Posto. The Sweet Life by Kate Zuckerman - not available online. Pierre Hermé from his book PH10, translated and transcribed on eGullet (the book costs about $270 and is only available in French). My plan for the bulk of this project is to go patiently through the macaron-making process, explaining all the different ideas that I and others have tried, what you may encounter, and what I've found to work best. But for now I'd like to expend some text on recipe comparison. After initially combining the Pierre Hermé restaurant industry mag and The Sweet Life recipes, I started to agonize over which one to try next. I didn't want to end up doing the same thing, without realizing it due to different wording or measurement conventions. I decided on two key variables that determine how a shell recipe is going to work. First, the type of meringue. 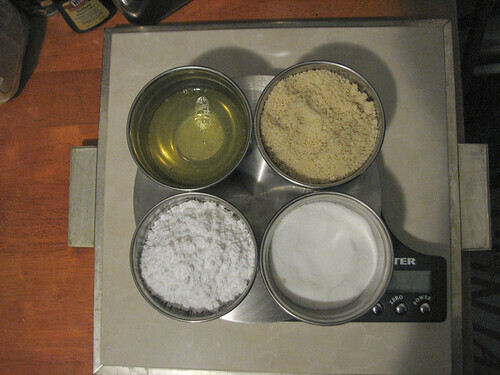 Second, the proportions of sugar, egg white, and almond flour. Almost all the recipes start by mixing the almond flour with some confectioner's sugar. Then the meringue is prepared by beating the egg whites and adding some other sugar. Finally the almond mixture (sometimes known as 'tant pour tant', or TPT) is folded into the meringue to complete the dough/batter. The following table attempts to condense all the recipes into an easily compared form by converting measurements to proportions. Where some cocoa powder was used, I've treated it as confectioner's sugar, since they are texturally similar. CDbPH 1.4 2.5 1.0 0 none! After making this table and reading the eGullet thread a dozen times I decided that 1.33/1.33/1.0/1.33 and Italian meringue represented a sweet spot of Hermé-ness. However when I tried the variation of adding some unbeaten egg whites to the batter, I found that it contained a fatal flaw that still baffles me. What I ended up succeeding with is therefore closest to Nicole Kaplan's recipe, though I pulled technique tips from many other sources. I didn't try all of the others, so they may well work just fine. In the next post we'll dive into the devilish details of this fickle concoction. Had a bit of a shock while watching the President's first press conference tonight. I heard him call on "Sam Stein, from the Huffington Post" and immediately thought of the Sam Stein with whom I attended summer camp for a few years back in the late nineties. And then, there he was, asking Obama his question! Way to go Sam. If you're reading this it means I've more or less successfully transferred my web hosting and Movable Type installation from Cornerhost to Dreamhost. I'd been with Cornerhost since September of 2003, and finally had enough. Dreamhost has about a thousand feature advantages over Cornerhost for about half the price. Some people knock them for jamming too many users onto each machine, or for their humorous attitude toward outages, but I never had a complaint while using them to host my company's website for a couple of years. (And let's be honest, this site is hardly in need of a private server slice.) Meanwhile Cornerhost claims to offer a more friendly level of customer service, but it's a one man operation, and other users frequently ask the mailing list where he's been for long stretches of time. So let's celebrate by uncorking a couple of links. Gothamist interviews Davy Rothbart, creater of Found Magazine and something of a personal hero of mine. I started reading Found in college when it was available at the local video store (Davy attended Michigan for a time before I did) and had the chance to hang out with the whole gang behind it a couple of times, around when the first book came out. I also sent them a bunch of my own finds, but as far as I know the only one they've published was in the Found Polaroid book, which I never received my free copy of (ahem). Good guys though. The NY Times 'The Hunt' column goes to Inwood. It sounds as if they ended up either on our block or one avenue over. Via WFMU's Beware of the Blog I've discovered the writings of Francis E. Dec, a fine practitioner of the art of insane rants that fill every square centimeter of a page, sent randomly to thousands of people and businesses. He was probably schizophrenic, but as the site devoted to him says, he also had a way with words. In weaving his surreal worldview Dec likes to string descriptive words together: "laser beam knife robot arms" and "proliferated degenerating parroting puppet con artist..." (that one goes on for quite a while). And then there is his central concept, the Worldwide Mad Deadly Communist Gangster Computer God. The style viscerally conveys his panic and paranoia. It reminds me of Radiohead or Flaming Lips lyrics, and inspires me to write some of my own. The illustrations that have been made to go along with the writings at the above-linked site also had me laughing pretty hard at work. I made a pleasant discovery yesterday while looking up the word salmagundi ("A dish composed of chopped meat, anchovies, eggs, onions with oil and condiments", and by analogy any assorted mixture). The full archives of the magazine, while accessible only to subscribers, can be searched by full content on Google. This is a great leap over the DVD-based Complete New Yorker, which only had keyword search, and the New Yorker site itself, which only allows you to search within the current issue. Try it by adding "site:archives.newyorker.com" to any query. For example, salmagundi. You can see from the snippets that the scanning job isn't perfect, but still, pretty great.